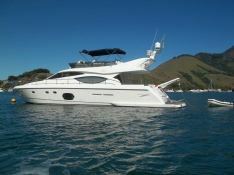 The Ferretti 600 motoryacht includes a series of important modifications that will revolutionize your quality of life on board, when you will be sailing along the brasilian coast of Rio, Angra dos Reis and Paraty. First of all the glass surface area has been increased to give an almost continuous coverage. 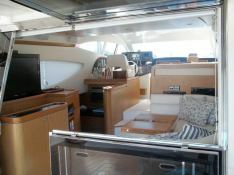 The positioning of the galley in the aft section is another fundamental change that affects not only the optimization of the internal spaces but also livability: it is possible to create an open space uniting the cockpit, galley and living area by opening the tilting window, therefore maximizing conviviality. The sleeping area has also been completely redesigned with the creation of a full beam master cabin with two open view windows and chaise longue, comparable to the master suite of a larger yacht. 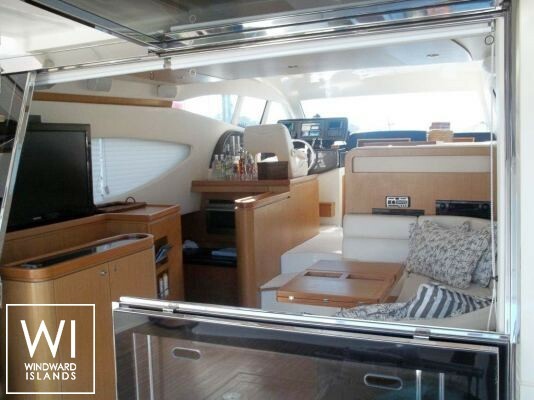 There is also a VIP cabin in the bow and a guest cabin with twin beds, all with en-suite bathrooms.This motoryacht is available for yacht charter with a base price of 46 200 $ (approximatly 40 966 €).